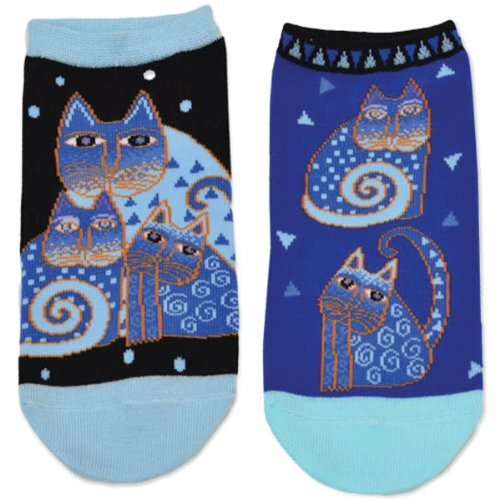 Try on a pair of our Laurel Burch Indigo Cats 2 Pair Pack of no show socks!┬á Two pairs per pack. Designed in Los Angeles, imported from Taiwan. 43% Acrylic / 27% Nylon / 13% Polyester / 14% Metallic / 2% Rubber / 1% Spandex K. Bell Socks was founded in 1979 by Karen Bell as a small business based in Los Angeles, California. A creative entrepreneur at an early age, Karen used her fashion sense and determination to create fun, fashionable socks and tights with her signature K. Bell charm and appeal. From humble beginnings K. Bell has grown into a multi-million dollar business with an international customer base and a strong retail presence. K. Bell Socks has a reputation for great designs and a quality product, currently selling to major retailers on an international level as well as high-end specialty shops throughout the country.